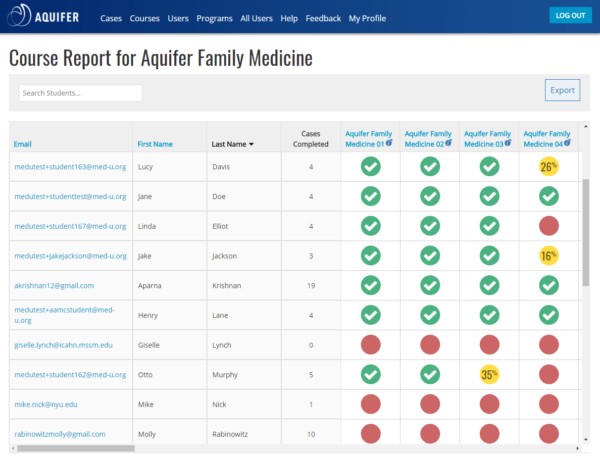 Aqueduct, Aquifer’s learning management system, is versatile, user-friendly, and full of useful features for our administrative users. We’ve designed the system for maximum flexibility, so you can manage your Aquifer subscription to fit your program’s needs. You can rest easy knowing that Aquifer courses provide students with consistent access to the full range of national curriculum standards. Aquifer’s content mirrors key learning objectives, helping your program meet accreditation standards. Setting up a new subscription to Aquifer for your program is easy. Our team is happy to arrange a personal video call for you and your team to walk through the Aqueduct learning management system and Aquifer courses to get you up and running quickly. Our comprehensive online support guide provides detailed step-by-step assistance—and our support desk is just an email or call away. With your subscription to Aquifer, you, your educators, and your students have direct access to Aquifer’s free interdisciplinary capstone courses at no additional cost. 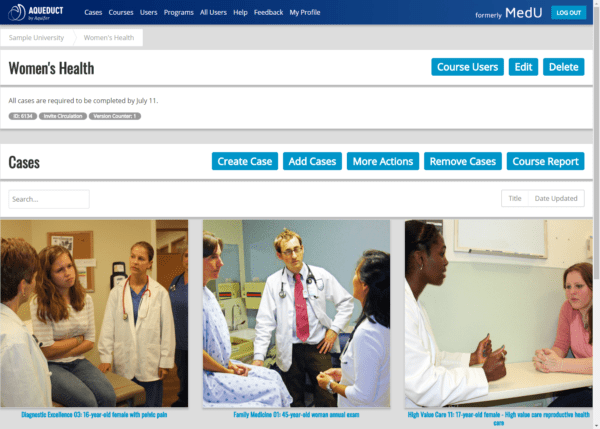 Free courses can be used as is, or by combining individual cases into a custom course to match your specific curriculum needs. Aqueduct gives you complete control over your users. 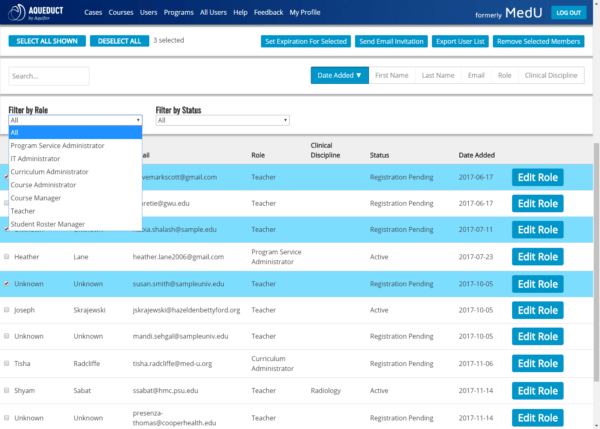 Our administrator roles and permissions structure allows you to assign access and distribute control to your users to match your program’s needs. You decide who sees reports, who can add students to the system, change user roles, create custom courses, etc. Our user management tools make it fast and easy for your team to add, remove, edit, export, and send email invitations to your students and administrative users. 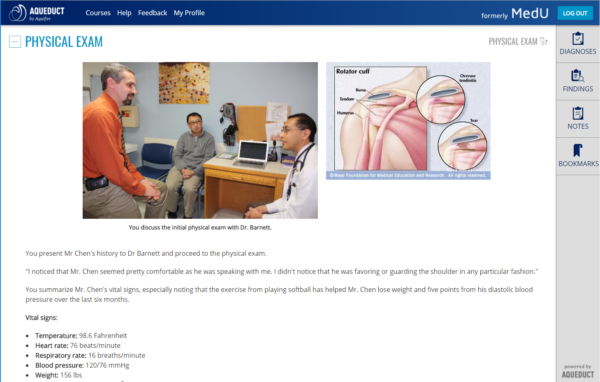 A range of easy-to-use reports track course and case usage for your program and show real-time student progress. Aqueduct reports can help you to follow students’ progress through the courses for grading or remediation purposes, record case and course use for curriculum planning, and view the total usage of your subscription. 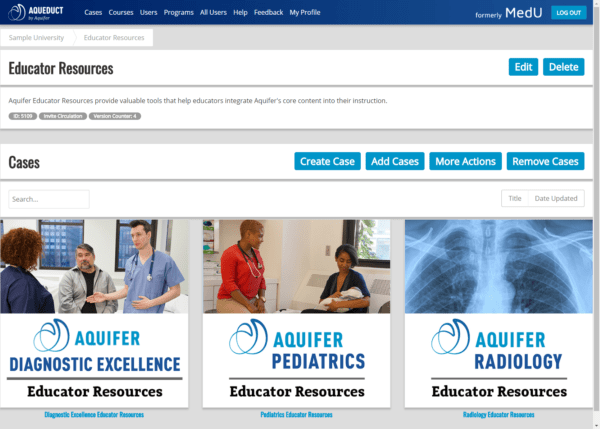 Aquifer is excited to announce that the multiple-choice exams which accompany our Aquifer Family Medicine, Aquifer Pediatrics, and Aquifer Radiology courses will be transitioning from their current summative format into a new, innovative formative assessment tool. The anticipated transition date is July 2020. View the full announcement about Aquifer’s change in assessment strategy. Educator resources and tools are available for many courses, providing valuable insights on integrating Aquifer courses into your curriculum, flipping the classroom, and team-based learning.